Day of the Dead or Dia de los Muertos is a holiday that is mainly celebrated in Mexico on November 1st and 2nd, right after Halloween. 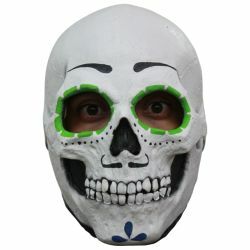 This masks is designed after the elaborate masks and face paints that are worn to celebrate this holiday. This mask is designed to emulate that look. This is a full size latex mask that fits over your head. Perfect for Halloween and haunted houses. Mask is one size fits all. For a more comfortable fit it is recommended that you wear a nylon hood underneath the mask.